Home Food & Cooking Healthy Eating E Numbers in Your Food: Should You Avoid Them? If you live in the United States, you’ve probably never come across “E numbers.” That’s to be expected. They’re mostly used in Europe as a way to identify substances in food. There are hundreds of E numbers, and some of them are pretty controversial. You might not need to worry about this if you stay in the U.S., but if you travel abroad, should you avoid them? E numbers are codes for substances that are used as food additives. These numbers are used in the European Union, but you’ll also spot them in Russia, South Africa, Australia, New Zealand, and a few other places, too. E numbers were first organized back in the 1960s to codify food colorings. Then, preservatives were added, followed by antioxidants, emulsifiers, stabilizers, thickeners, and gelling agents. There’s a pretty strong movement against added colors, but not all added colors are bad. Within the E numbers, you can find natural foods or spices used to give food its hue. For example, E100 gives food it’s yellow-orange color, and it’s taken from the curcumin in turmeric. Red colors like E162 come from beetroot, while saffron is what gives E164 is golden, red color, along with tomato-based lycopene, or E160d. But that doesn’t mean all E number colors are suitable. Take the “Southhampton six”, for example. Research shows that a group of six food coloring agents was linked with hyperactivity in children. These numbers are E102, E104, E110, E122, E124, and E129. Preservatives help to prevent microbes from growing in food. 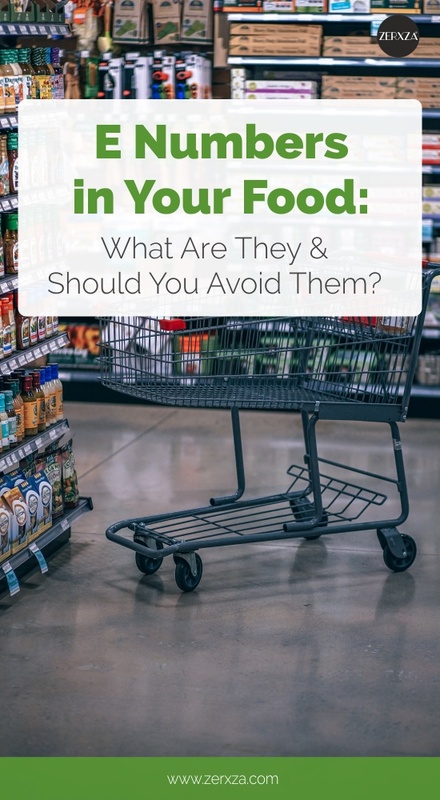 And if you’re not buying whole, fresh foods, chances are, the packaged, processed food you buy has at least one type of preservative – even in the United States. It just won’t be listed as an E number. Take sorbic acid or E200. This is a natural, organic compound used to preserve food. There’s no need to avoid this. But there are other preservatives that are far more problematic, like E240 (formaldehyde) or E250 (sodium nitrite). Antioxidants are a powerful nutrient that help to fight free radical damage, oxidative stress, and aging. So, you might be familiar with “Ascorbic Acid/Vitamin C” on a food label, but that’s exactly what E300 is. Then, there are tocopherols (Vitamin E), which you may spot in beauty and cosmetic products, and for good reason. It’s a wonderful nutrient for the skin. In the European Union, this would show up as E306. These substances are commonly used to keep oily and watery substances blended and mixed together. So, you will see them in soups, sauces, condiments, etc. Gums, in particular, give foods the right texture and also give them longer shelf life. While they are widely used throughout both the United Kingdom, the European Union, and the United States, research says some can irritate the digestive system by destroying good bacteria. This is especially true for people who have a gluten sensitivity or a comprised digestive system. Top thickeners and gums to avoid include carrageenan (E407), xanthan gum (E415), guar gum (E412) and locust bean gum (E410). If you have a digestive issue, you may want to double check the ingredient list for any E numbers that go from 400 to 499. These may cause digestive upsets. You can expect to see these numbers in baked goods. Take, sodium bicarbonate, which is something we use in the United States. In E numbers, it’s identified as E500. What you do want to watch out for, however, is aluminum, which is used as a firming agent and acidity regulator. It is listed as E520 through E523. It’s true that the amount of aluminum used in any food or cosmetic product may be very small. However, aluminum is a known neurotoxin, and it’s also linked to degenerative brain diseases, such as Alzheimer’s and Parkinson’s disease. Obviously, this is not to say that eating a muffin, which contains E520 will lead to dementia. However, the substances we do consume really matter, and it’s best to avoid those which are a known threat to our health. Flavor enhancers are common in processed foods. They make the item taste more palatable. But you have to ask if the food doesn’t taste good on its own, is it worth eating? This is particularly true if the food contains E621, or monosodium glutamate – the notorious MSG. This is what’s commonly found in Chinese takeaway and other fast food options. Some people are very sensitive to MSG and can have symptoms like headaches, numbness, tingling, weakness and fluid retention. For some people, high enough intake of MSG can result in an asthma attack. Antibiotics are pretty explanatory, and they will likely show up in supplements and over-the-counter medications. If you do consume anything with an E number ranging from 700 to 799, be sure to support your gut health, too. Antibiotics don’t just kill off the bad bacteria. They wipe out the good bacteria in your gut, too. Ever wonder why a bag of chips stays puffed up? It’s due to nitrogen, or E941. Along with packaging gas, you’ll also find waxes, paraffins, and sweeteners like aspartame (E951), sucralose (E955), xylitol (E967) and erythritol (E968). In this final set of E numbers, you’ll find stabilizers, thickening agents, and emulsifiers. If you like to avoid these in your diet, just be on the lookout for any of these numbers. 1,599 substances is a lot to keep track of, and some people might argue that you should avoid all E numbers. But as you can see, that’s not necessarily true. Not all E numbers are inherently bad, and some are not only natural but also pretty standard. If you plan on traveling abroad, consider reviewing the E numbers and identifying the numbers you definitely don’t want in your food. This can help you adhere to your usual diet while you travel.